You may recall the post from July 12th titled, Congratulations to Derek Kief and His Family (and Fascinating Discovery). In that post we revealed that Derek’s stepfather, Adrick Ceasar (formally Adrick Harrison) was an amazing wide receiver for Furman University from 1992-1995. In this post, we will crack open a time capsule exposing the football legacy of Kief. The legacy of Kief began with Pat Kief, Derek’s grandfather. Pat played in the very same league that his grandson plays in today, the Greater Catholic League (GCL). 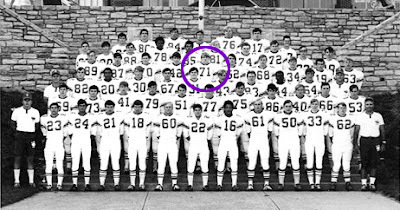 Branded with #71 on his back and purple blood pumping through his veins, he was an offensive lineman for the Elder Panthers.